Why do tornados and hailstorms rest on weekends? 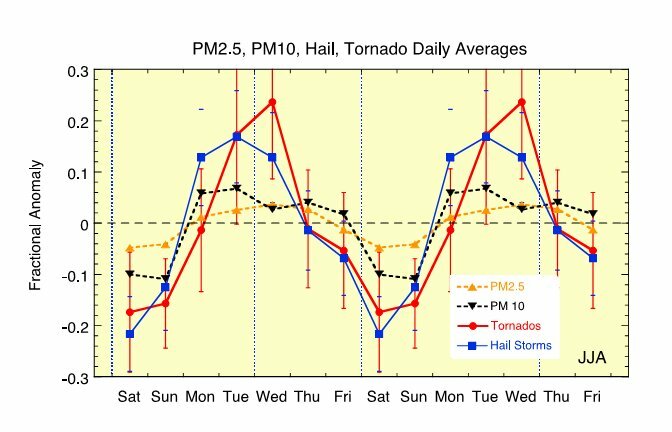 This study shows for the first time statistical evidence that when anthropogenic aerosols over the eastern United States during summertime are at their weekly mid-week peak, tornado and hailstorm activity there is also near its weekly maximum. The weekly cycle in summertime storm activity for 1995–2009 was found to be statistically significant and unlikely to be due to natural variability. 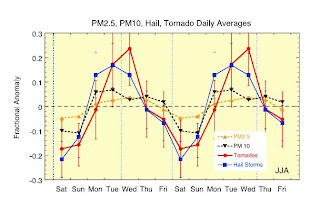 It correlates well with previously observed weekly cycles of other measures of storm activity. The pattern of variability supports the hypothesis that air pollution aerosols invigorate deep convective clouds in a moist, unstable atmosphere, to the extent of inducing production of large hailstones and tornados. This is caused by the effect of aerosols on cloud drop nucleation, making cloud drops smaller and hydrometeors larger. According to simulations, the larger ice hydrometeors contribute to more hail. The reduced evaporation from the larger hydrometeors produces weaker cold pools. Simulations have shown that too cold and fast-expanding pools inhibit the formation of tornados. The statistical observations suggest that this might be the mechanism by which the weekly modulation in pollution aerosols is causing the weekly cycle in severe convective storms during summer over the eastern United States. Although we focus here on the role of aerosols, they are not a primary atmospheric driver of tornados and hailstorms but rather modulate them in certain conditions. For a general audience article check out the write up at National Geographic, here. Of relevance is a variety of prior work on weekly weather cycles such as this paper in Nature and this paper also by Dr. Bell.